The RECEPTOR VIP is Muse Research's new entry-level RECEPTOR and replaces the RECEPTOR 2+ model in their product line. It is expect to start shipping in the Spring of 2012. The RECEPTOR VIP features a completely new hardware and software design with a very simple user-interface that makes it easy to find sounds or effects of interest and load them quickly for performance. This interface makes use of the SoundFinder™ technology that was developed for the MuseBox, and involves simply selecting a TAG (or category) and then browsing the presets in that TAG. Users can create their own TAGS making it super convenient to organize presets into set lists or by individual gigs. The VIP also has a new Graphical User Interface that is based upon a "virtual rack" paradigm, letting you drag and drop plugins into the central rack, and then create splits, layers, or assign effects to the various inputs. Virtual instrument slots let you set keyboard play ranges, and the all-new MIDI learn function lets you assign various parameters to your particular controller quickly and easily. All the audio in the rack is then mixed through a stereo output channel that lets you add two more insert or send effects before arriving at the main outputs. You can have up to 16 channels open in the rack, letting you push the envelope of your creativity! Audio I/O features super-high quality, low-latency stereo inputs and outputs on the rear panel, a full size MIDI input on the rear panel, as well as a pair of mic/guitar inputs on the front panel along with a headphone output. Either the front or rear panel inputs can be selected on a patch by patch basis, and should you use the front panel inputs, the rear panel inputs are still available for passive mixing with the main output so you can play along with external gear like drum machines, synths, or MP3 players. The processing is done using a super-fast dual core processor with 4GB of RAM and a 1 Terabyte hard drive.... more than enough to run even demanding plugins like Ivory 2, KOMPLETE 8, or Omnisphere. 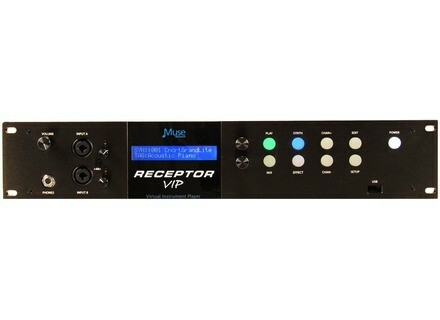 In fact the RECEPTOR VIP comes pre-configured with a variety of software instruments and effects that are included in the price, as well as having KOMPLETE 8 and many more other "premium" plugins pre-installed and ready to purchase or authorize, making it easy to get the RECEPTOR VIP configured and making music. All of these features are packaged in an all steel and aluminum rack-mount case with an auto-ranging power supply that works anywhere in the world. Muse Research and Development has started shipping their new Receptor VIP dedicated hardware plug-in player.